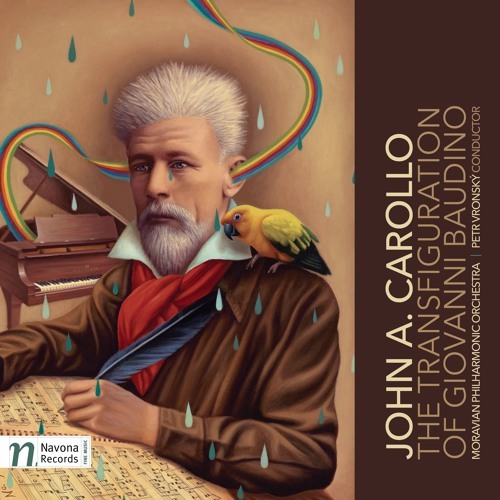 THE TRANSFIGURATION OF GIOVANNI BAUDINO JOHN A. CAROLLO MORAVIAN PHILHARMONIC ORCHESTRA | PETR VRONSKÝ CONDUCTOR John A. Carollo’s newest release, THE TRANSFIGURATION OF GIOVANNI BAUDINO is a fascinating mixture of music written for different orchestral instrumentations and with wildly varying intended emotional responses. The composer himself may best define the intangible aspect of his music’s emotive intentions, writing, “I have always preferred to let music speak for itself. We each derive our own unique personal meanings from our listening experiences and most of it is felt viscerally.” The visceral is, in the case of much of the music presented on this release, never far away. Carollo’s writing for strings in the five movements of The Rhetoric and Mythos of Belief emphasizes the tremulous and melodic, yielding a varied but consistently inspired musical color palette. Throughout this lengthy work the hues of the string ensemble sound tend toward the amber, allowing the luster and huskiness of the lower voices to often become a focal point. In these lush textures, slowly unfolding melodic materials easily maintain primacy of placement, and the many harmonic voices of the ensemble combine in a refined coherency. Likewise, the works presented on THE TRANSFIGURATION OF GIOVANNI BAUDINO featuring full orchestra each, in turn, define their own aural landscapes. The title track is defined by scampering, freewheeling melodic materials that make their way throughout the instruments of the orchestra. Skirting the edges of tonality, the piece takes full advantage of the many timbres and orchestral coloring that can be achieved by a large ensemble. This, like Carollo’s other works, has a structural resiliency that both embraces and simultaneously defies the melodic and harmonic materials that constitute it. It can be hard to paint the six works making up THE TRANSFIGURATION OF GIOVANNI BAUDINO with a single brush. Do You Have an E.R. for Music?, another orchestral work, couldn’t be farther in emotional intention or impact from The Rhetoric and Mythos of Belief, yet somehow the two pieces exist admirably as separate sides of a single coin in this collection of Carollo’s works. The composer’s dexterous control of the orchestra shines on this release, and the impassioned playing of the Moravian Philharmonic Orchestra, under the direction of Petr Vronský, only accentuates the sheer strength of Carollo’s compositions.